Holiday sales season is around the corner, and getting the supplies you need in the time you need them is critical. We get it, which is why 98% of our orders ship within one business day. We have warehouses on the west and east coast to ensure fast shipping times too. Get ready for the holiday rush. You’re gonna’ do great. Here is a tip for you: You need a promo code to activate the sale. Sign up below to get it. Promotion ends November 30, 2016. Discounts only apply to stock items; they do not apply to clearance or custom products. Promo codes cannot be combined. Get our Fall 2016 catalog. You can view/download it or request a hard copy of it here. Only one place where you can find us this month. Swing by for a 10% off coupon… or just because you want to say hi. We like that too. Did you detect a hint of lavender or cayenne pepper in your chocolate? Here are five packaging ideas to help the professional chocolatier personalize his or her exquisite creations for a unique chocolate experience. This California-based designer let her imagination run wild with her childhood box of LEGOs. Kristina Philage Fassberg layers nostalgia and ingenuity to create products based on LEGO elements. Check out her work and packaging advice. A quick tutorial on Halloween Boo Baskets including a printable and link to a Pinterest board with additional basket inspiration. 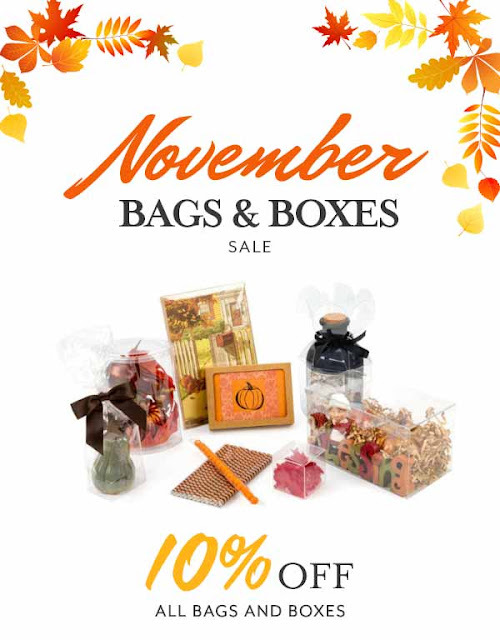 This promo applies to all stock bags and boxes on ClearBags.com. It does not apply to custom bags and boxes.